Whenever I need a peaceful, calming activity I tend to turn to Hama beads. There’s something about them that attracts all the children, including any visitors, at once and keeps their attention for a very long time. We’ve got plenty of Hama beads and boards really, but you can never have too many, and the children are always inspired by a new kit. They were very excited to receive this lovely Woodland Kit, and a selection of extra boards, from Craft Merrily last week, and couldn’t wait to dive into it. The big boys made the owl and the squirrel from the Woodland Kit, and I was really impressed by their concentration as they were quite fiddly designs. I loved the results too. The little ones had fun with the extra boards, and produced a slightly scary rabbit and an extremely colourful flower! 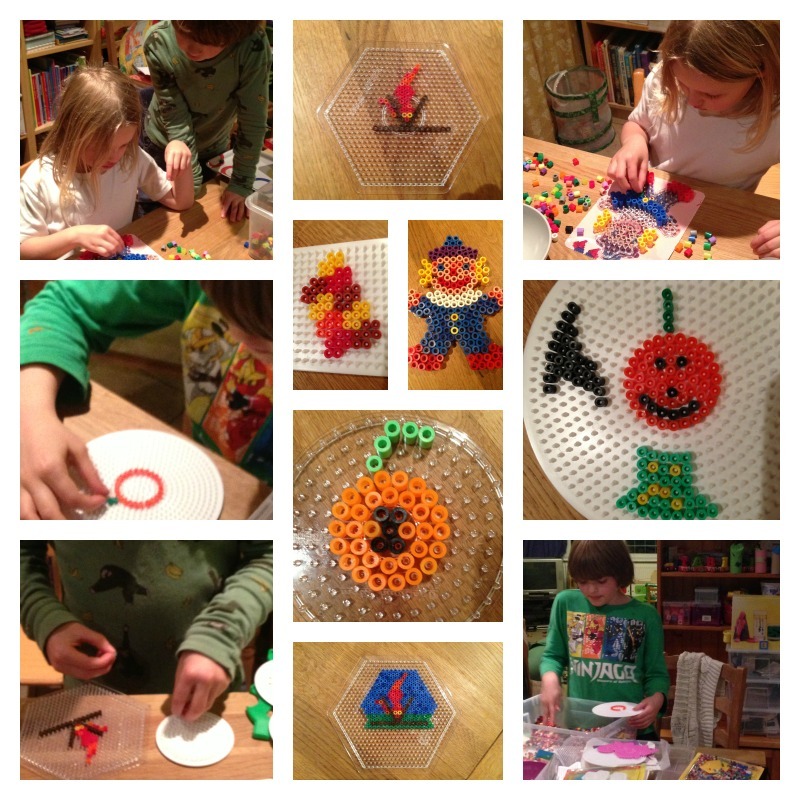 We really enjoyed having some new Hama bead inspiration, and I think we’ll be doing a lot more over the next few weeks. I hope to share some Christmas Hama designs here soon, though I expect there will be quite a few random ones too! We received the Woodland Kit and a selection of boards free for the purpose of this review. 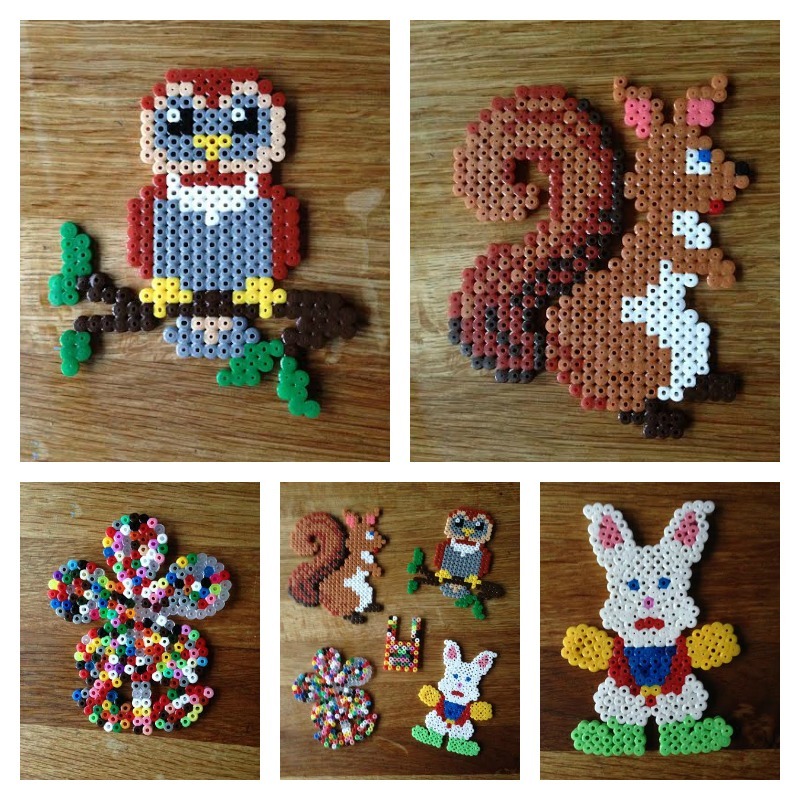 This entry was posted in Craft, Hama Beads on November 16, 2014 by Hannah. It’s educational carnival time over on Jax’s blog again, and as usual I’m writing this considerably after the eleventh hour. I hope she’ll let me off, and I can sneak this post in at the last minute. 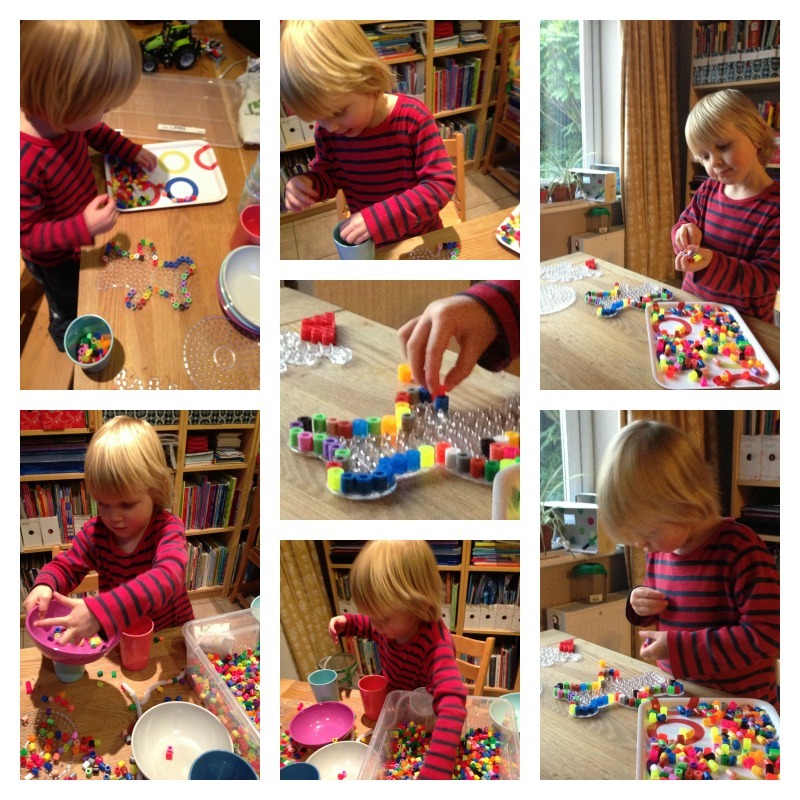 This month the question is “What do you do when it rains?” There are lots of indoor activities I could write about if I had plenty of time, but I haven’t so I’m just going to focus on two of our favourites – Lego and Hama Beads. While we’ve been staying at mum’s house over the last few days, the children have been working on this Lego scene. I think it was mainly made by Owl, but Monkey and Rabbit had some input too. 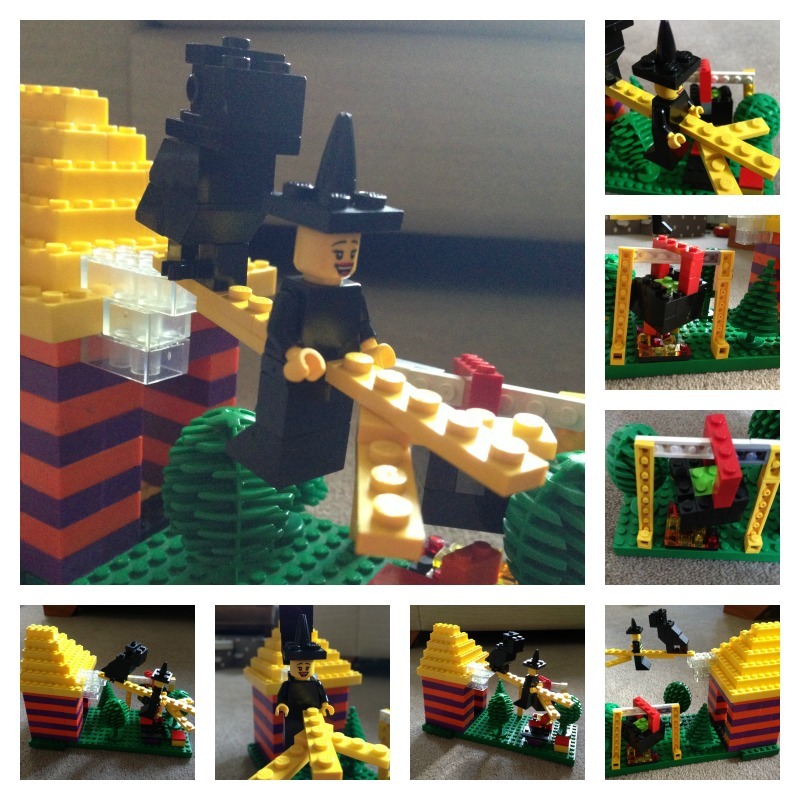 I love the details – the green slime in the cauldron, and the fire beneath it, made of transparent bricks. 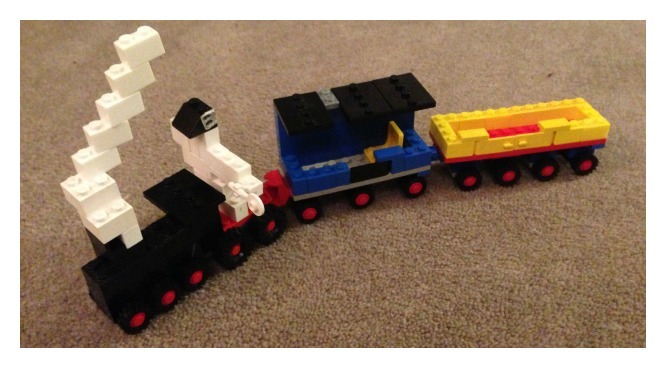 Owl also made this ghost train, which was very popular with Tiddler. 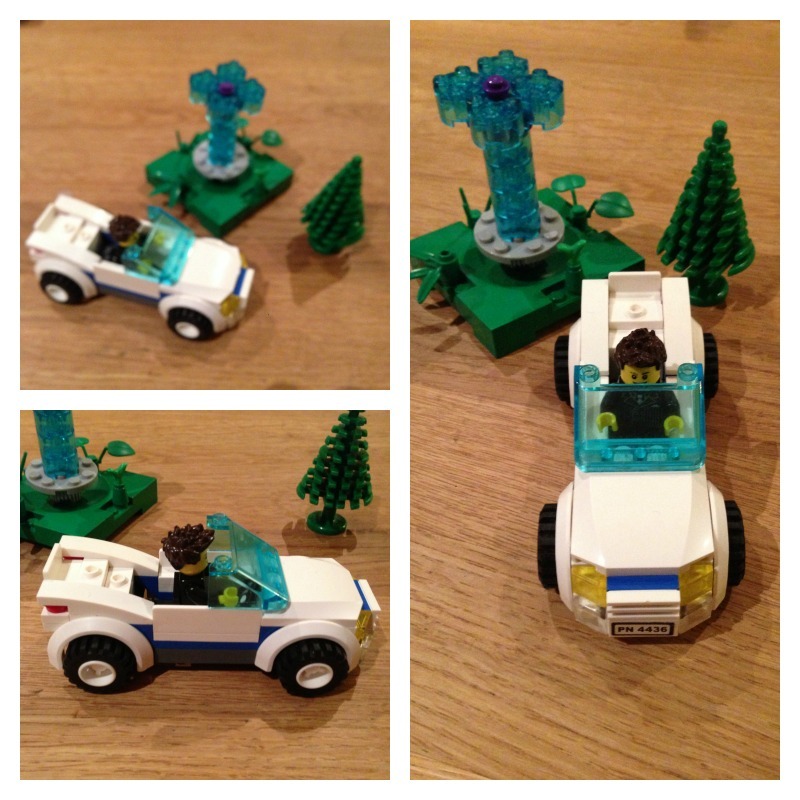 When we came home today, it wasn’t long before the Lego was out again, and Owl made this car (not from a kit) and fountain. 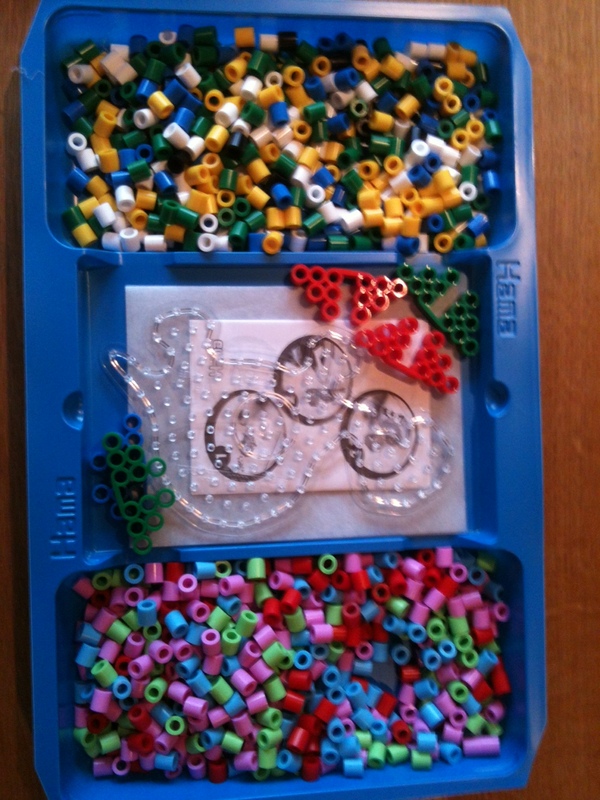 In the evening, while Rabbit was at Rainbows, Tiddler played with the Hama Beads. He started to make a Teddy Bear but was not in the mood for finishing it, so I suggested he could sort the beads into different colours. 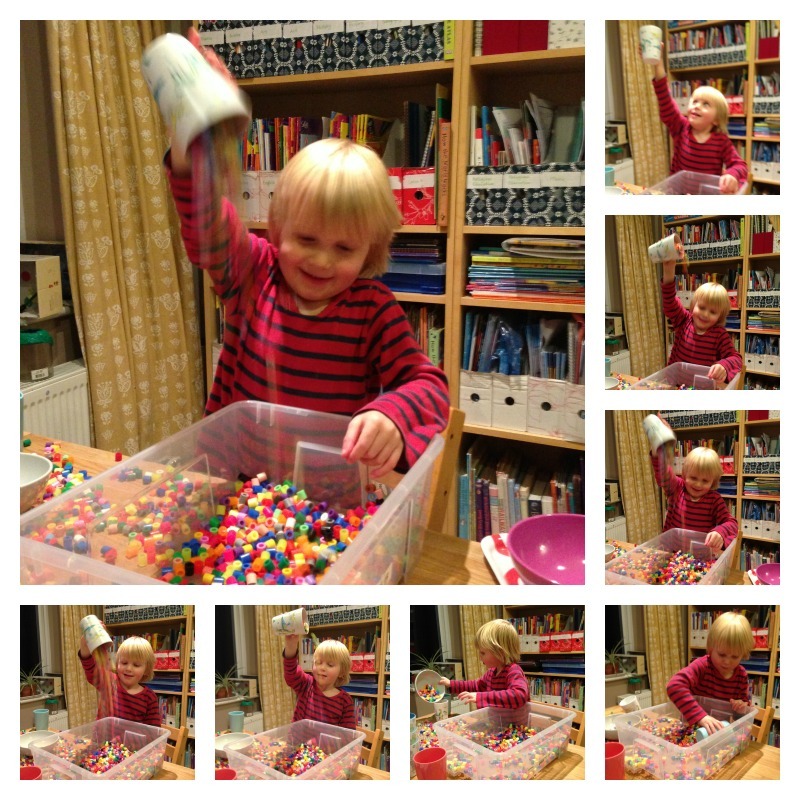 He liked that idea, until he discovered it was more fun just to put handfuls of beads into all the cups and bowls and then tip them out again! Then he discovered it was more fun to tip them from a higher up, which was great until he started tipping them on the floor. Presumably some kind of highly justifiable toddler science experiment about how the height affects the speed. Or something. I asked him if he would like to try threading the Hama Beads on pipe cleaners (thanks for the idea Jax!) 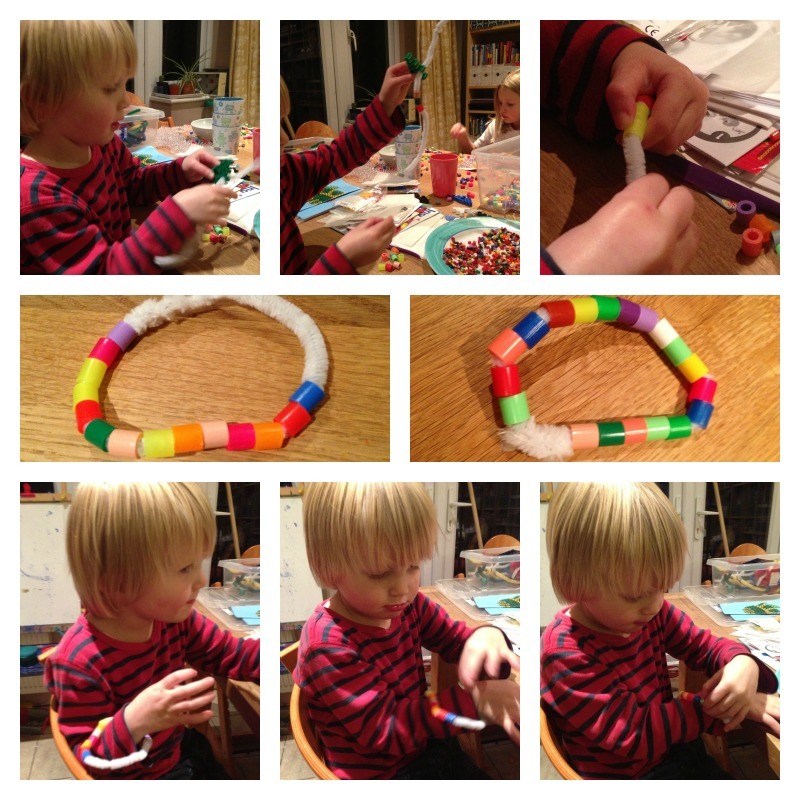 He wasn’t that keen (“You do it, mummy!”) until Rabbit came back from Rainbows and made a bracelet, after which he quickly made one for himself. I suggested to the older three that they might like to make some Autumn-themed pictures. I made a some leaves (kind of) in Autumn colours to start them off, and explained that it was a tessellating pattern. I can’t say they were as excited about that as I was, but at least they know what tessellation is now! Monkey spent a long time carefully making a bonfire. Owl made a pumpkin, a witch’s hat and a monster. Rabbit wasn’t interested in the Autumn theme at first so she made a clown, but when she saw Owl’s pumpkin she decided to make one of her own. 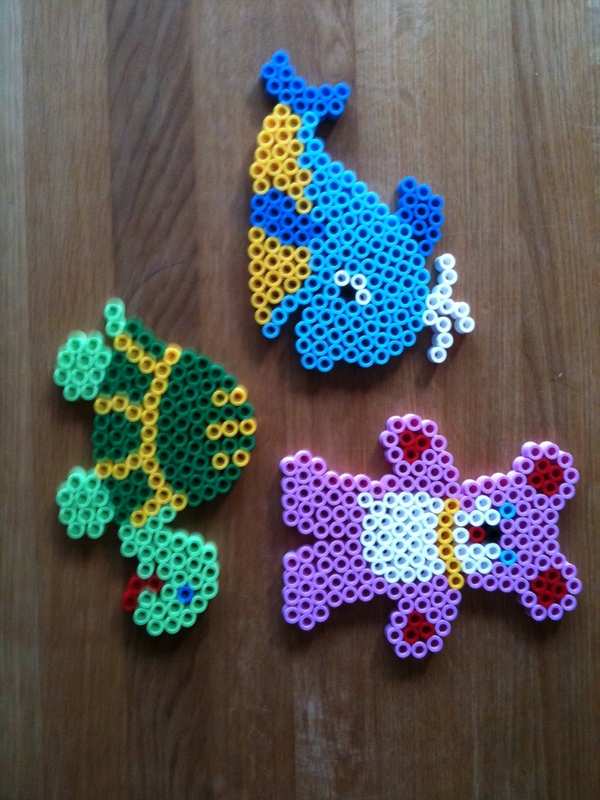 These are the finished Hama Bead creations. And this is where we buy our Hama Beads. We’ll be needing some more soon, I think, now the weather is getting colder and wetter. These are our top two indoor activities. What are yours? 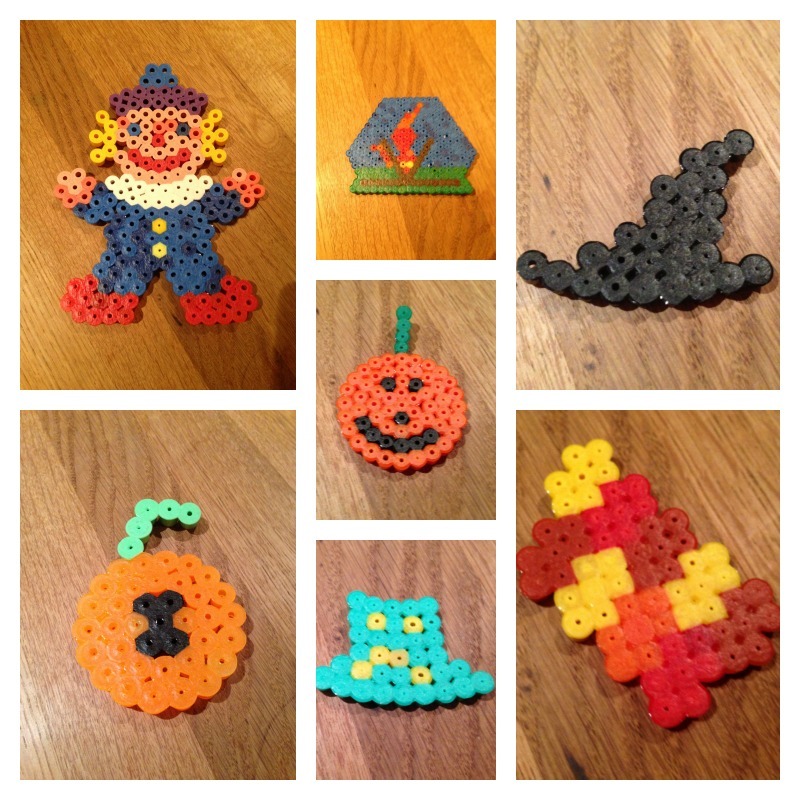 This entry was posted in Hama Beads, Lego and tagged hama beads, lego on October 24, 2013 by Hannah. The big three and I spent this morning shopping, which was successful but quite tiring. It was so cold, and my back was bad, but we got everything done, and I was cheered up by two things that happened in the last shop we went to. Firstly, an elderly gentleman dropped a ten pence piece and asked Rabbit to pick it up. When she gave it back to him, he told her she was a very kind, helpful girl, and gave her a pound coin. Then, when we were paying for the shopping, the children were being very chatty to the lady serving us. I was just wondering if I should rein them in a bit when she commented on their confidence and friendliness, and their good behaviour, saying “They are a credit to you!” Next time I notice other people’s children behaving well or just being lovely, as children generally are, I’m going to make the effort to say something like that to their parents, because it is good to hear! After a morning out at the shops, we needed a quiet activity for this afternoon which would keep everyone involved while I got on with the housework, so I decided it was time to get the Hama Beads out again. We started as soon as we had finished lunch and just about managed to clear all the beads off the table by supper time. Rabbit and Tiddler spent quite a long time independently making patterns with the Maxi beads, but we didn’t manage to iron, or even photograph any before they got tipped off the boards. After a while, Tiddler decided to play with his Lego Duplo train track, which kept him busy for most of the rest of the afternoon. 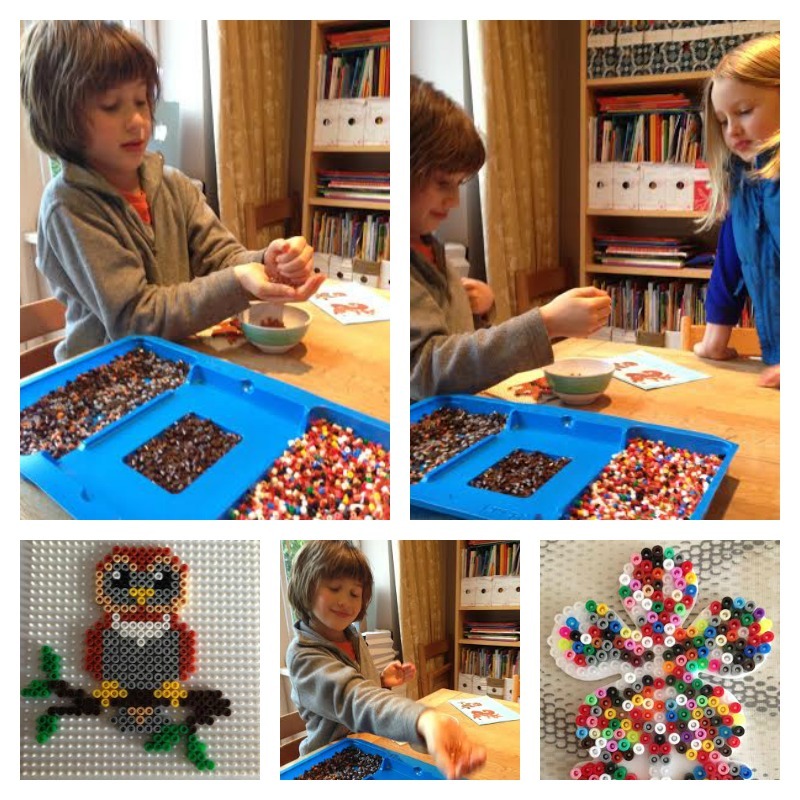 Meanwhile, Owl used the Maxi beads to make up his own design, a picture of a dog and a tree, with a frame around it. He also made a pattern of stripes, going from transparent and white beads, through light and then dark colours, and ending with black. Rabbit made a flower and a ladybird with my help, and Monkey made this elephant. They all worked on their designs for a long time, and I was very impressed with their concentration. 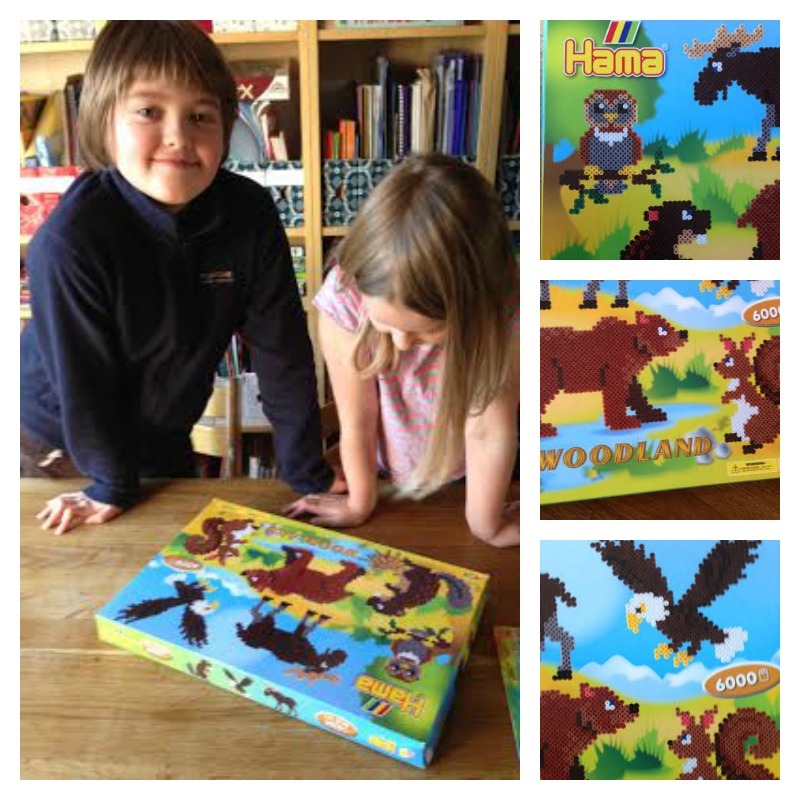 This entry was posted in Hama Beads and tagged hama beads on April 2, 2013 by Hannah. 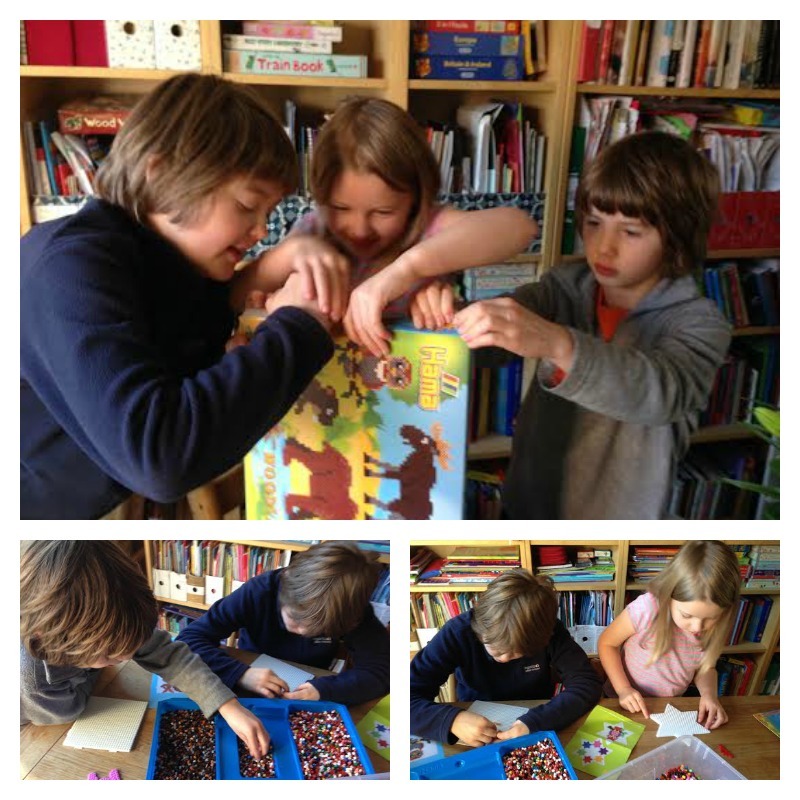 We’ve been at it again… just can’t get enough of Hama Beads at the moment. Snowman by Owl, Father Christmas by Monkey, Clowns by Tiddler and Rabbit. Kits available from Craft Merrily. There’s just about time for one last order before Christmas! 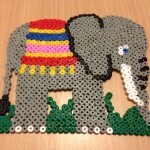 This entry was posted in Hama Beads and tagged Christmas, hama beads on December 19, 2012 by Hannah. A few weeks ago we tried out an excellent Maxi Hama Bead set from Craft Merrily, and today we had a go at a similar starter kit for Midi Beads. My First Midi Hama Beads comes with about 2400 beads, 3 transparent pegboards, printed design cards, a frame to keep the design secure under the board and some ironing paper. I’d been saving it until we had plenty of time to get stuck into it, as I knew it would keep us all busy for a while. So today, after a morning of violin lessons (the big two) and Musicbox (the little two), a bit of Mathletics and Reading Eggs, and a “Feed Yourself Friday” lunch, we settled in for the perfect craft activity for a rainy Friday afternoon. We managed to do all the designs from the set, as well as some original creations using both Midi and Maxi Hama beads, and this time I even did some myself as well as helping the kids with theirs. So, out of the main set, Rabbit did the teddy, Monkey the kite and the butterfly, Owl the parrot and the cat and I did the fish, sun, car and boat. In addition to all that, Owl made a circular design (which I think is a firework), Monkey made a hanging star decoration, Rabbit a snowy tree picture and Tiddler completed his first ever Hama Bead creation, a teddy. Rabbit then made another teddy, using up all but the last six Maxi beads. It took us about three hours, and with the ironing as well (of all fourteen designs!) we ended up having supper rather late. It was a good afternoon though. There really is nothing quite like Hama Beads for keeping all my children happy and quiet at once for a very long time, and now that Tiddler can do it too it’s even more satisfying. Hama Beads are certainly on our Christmas list, and if you are looking for last-minute presents there’s still time to order some here. Suitable for children of all ages and the young at heart. I’m not the only adult who would like to receive Hama beads for Christmas, am I? No, I think I’m in good company. 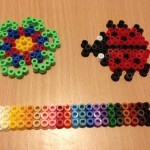 This entry was posted in Hama Beads and tagged maxi hama beads, midi hama beads on December 15, 2012 by Hannah. We got the Hama Beads out again yesterday. This time it was a Maxi kit that I have been saving for while, and I really meant to do it when Tiddler was around, but he was out shopping with daddy and the others chose it over the Midi kit I also offered. It was quite satisfying, as they could each do one design, and because it was Maxi they were all completely independent. The kit comes with a divided tray, which Monkey and Rabbit enjoyed using together, and Owl did his after they had finished. It would make a good Christmas present for a young child, as a simple introduction to Hama Beads. The pegboards are transparent and can be placed over the pictures, which makes copying the designs easy. I really like the fact that the kits come with a generous amount of extra beads, so it doesn’t matter if one or two get lost, and after a few kits you can build up quite a good stash of extra beads for repeating the designs or making up some of your own. The kit also comes with stands for displaying the finished creations. We love the kits, and it’s fun copying the designs, but the children are also getting more confident about making up their own. I enjoy doing it too, though I haven’t yet ironed any of mine to keep. I always think I should save the beads for the children, but that might have to change. I’ve been looking around for ideas and there are so many things I want to try. Here are just a few of them – if I put them here, maybe I’m more likely to get on and do them! 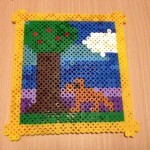 This entry was posted in Hama Beads and tagged maxi hama beads on November 25, 2012 by Hannah.